Free Shipping Included! TMS Set of (2) 8 Quart Stainless Steel Rectangular Chafing Dish Full Size Buffet Catering by TMS at Baking Love. 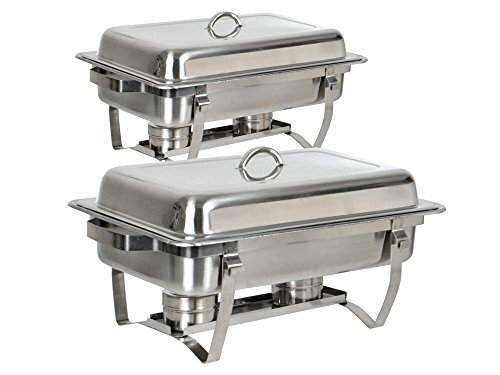 MPN: ChafingDish-MS-Silver(2pc/1bx). Hurry! Limited time offer. Offer valid only while supplies last. Quantity: 2 Sets. Condition: Brand New. Color: Silver. Material: Stainless Steel. This stainless steel 8 quart rectangular dish is ideal for buffets, hotel breakfast areas, brunches, catering, parties, wedding banquets and self-service environments. Made of stainless with a uniquely designed frame. This chafing dish can last a long time and is easy to clean and store. Features: Elegant design and durable frame. Mirror finish. Dripless water pan. Comes with 2 x water pan, 2 x food pan, 2 x lid, 2 x frame and 4 x alcohol furnace. Chafing burners NOT included. Specifications: Overall Size: 24"L x 14"W x 11 1/2"H. Volume: 9L / 8 Quart. Inner Size: 19 1/2"L x 11 1/2"W x 2 1/2"H. Food Pan Size: 19 3/4"L x 12"W. Alcohol Furnace Size: 3 1/2"Dia. x 2 3/4"H.
Package Includes: 2 x 8 Quart Chafing Dish.